Unless you choose Invisalign, getting braces typically requires a shift in many everyday habits. With brackets and wires, you have to use special interdental toothbrushes to get between brackets and underneath wires when you brush and floss. With Invisalign in Lunenburg, MA and Harvard, MA, your smile-changing experience will only require a couple of minor changes in your day-to-day routine! 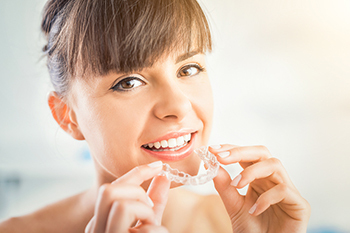 Additionally, Invisalign uses clear, plastic aligner trays that are removable. This allows you to eat whatever you want, play any sports you want, and play whatever instruments you want, without being forced to adjust to the requirements associated with traditional orthodontic braces. You only need to brush your trays when you brush your teeth (after every meal) and remember to swap to the new trays every two weeks. No one will even know you are straightening your teeth! Show off Your Smile …Not Your Braces with Invisalign! Unlike with traditional metal braces, Invisalign in Lunenburg, MA, and Harvard, MA, lets you enjoy the same foods as before, because you can remove the aligners before eating. You also never need to suffer from bad breath issues, because you can still brush and floss as you normally would. Invisalign has no metal brackets or wires to pinch or poke the insides of your mouth. This helps kids to feel happy at home and school. They’ll also thank you for spending less time at our orthodontic office, since it will free them up to spend more time with their friends and to enjoy the activities they love! When you are ready to learn more about Invisalign, call 978.345.7988 or click here to request your complimentary, no-obligation Walker Orthodontics Smile Assessment!